We believe in knowledge-based consulting engagements that ensure addressing root causes, not just symptoms. Though clients usually have definite ideas about the problems that plague them and their organizations, it is best practice to gather objective data and talk to key stakeholders before implementing a solution or launching significant organizational change. Schedule a consultation to learn how we can help deliver objective diagnostics and evaluations that lead to targeted solutions for success. Do you want to start a business or improve your effectiveness in your current venture? Are you clear about your entrepreneurial strengths and your thought processes, compared to other successful entrepreneurs? Do you want to increase your chances of success? 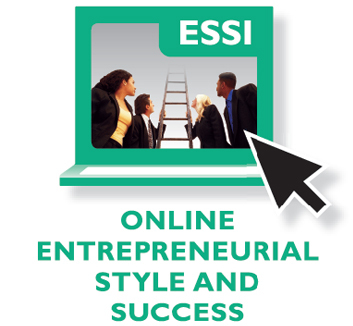 If your answer is Yes, the Entrepreneurial Style and Success Indicator (ESSI) is for you. Effective and successful leadership is not an accident and requires specific and measurable leadership skills. Organizations, teams, and families are always a reflection of the competence of the individuals leading them. 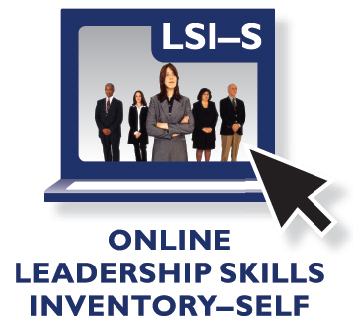 Leadership Skills Inventory-Self (LSI–Self) provides leaders with the necessary metrics to develop their transformational leadership skills with a section provided to plan for your leadership development. 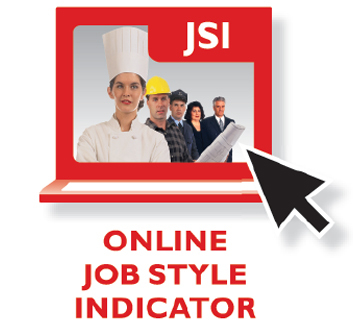 Would you like a clear way to assess your team member’s style and behavioral tendencies? 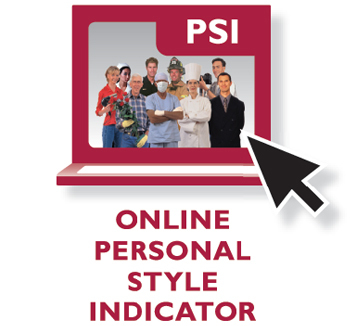 The Personal Style Indicator (PSI) is a powerful communication and learning tool. 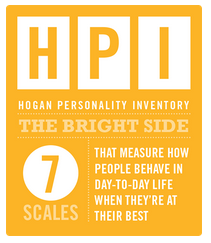 Discover your team member’s personality and how it “fits” in the world around him or her. Determine their behaviors around tasks so you can be more effective in your work together. Share the knowledge with your team members and impress them with the insights! Do you know anyone with a little STRESS? Stress and Health are two topics that affect everyone. 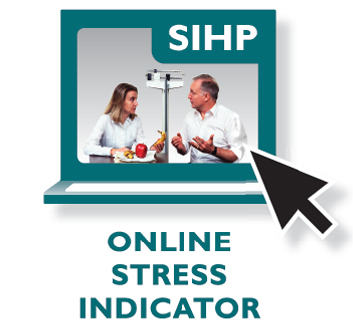 The Stress Indicator and Health Planner (SIHP) assesses your and your team members’ current level of stress and health. Use it to understand how to enhance overall well-being, manage stress, and improve performance. Life is too short to die from a heart attack at the halfway mark! Leaders make wise yet surprisingly quick decisions. How? They know their Core Values beforehand. When you understand what your values are, confusion disappears and inner clarity develops. 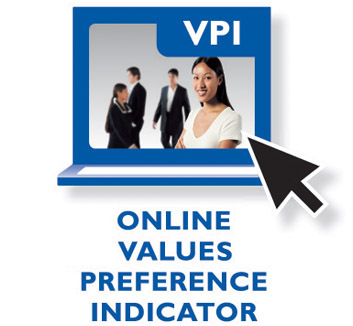 The Values Preference Indicator (VPI) identifies those core values. When you know someone else’s Core Values and can match them with your own, you can build trust and understanding. You may have the right person for the right job; now can you TRUST him or her? Find out how much. The LEA model consists of 22 behaviors. 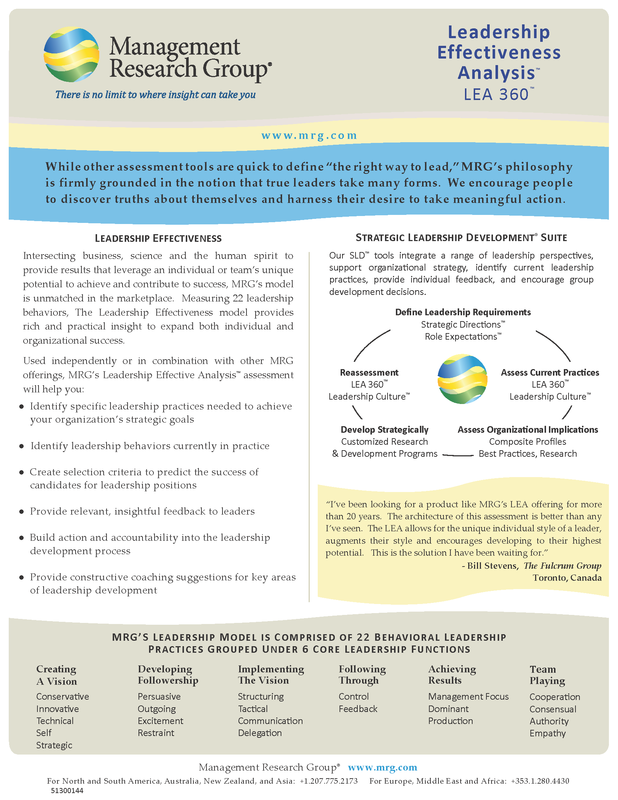 This model has the breadth and the flexibility to provide and integrate a range of leadership perspectives, including support for organizational strategy, illustration of current leadership practices, provision of individual feedback and information for group development decisions. Identify and communicate specific leadership behaviors and practices needed to achieve strategic goals. Provide relevant and behavioral feedback to leaders. Build action and accountability into the leadership development process. It links an organization’s business strategy with the leadership practices that are needed to support the corporate goals and objectives. It provides the vehicle for leadership development and action planning. The data can be used to conduct a training needs analysis. It can be used for succession planning. It provides a focus and common understanding of the leadership practices needed to support the organization. 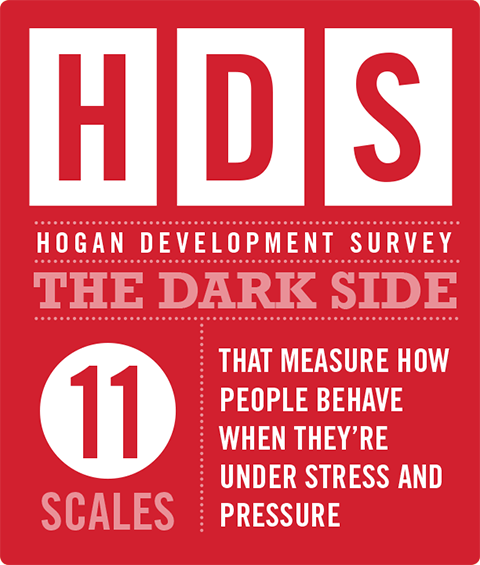 It can help individuals and organizations to measure and facilitate change. It can help an organization identify the components of performance effectiveness at the individual and organization level through success profiling and benchmarking. It can be used as part of an organization’s selection process. 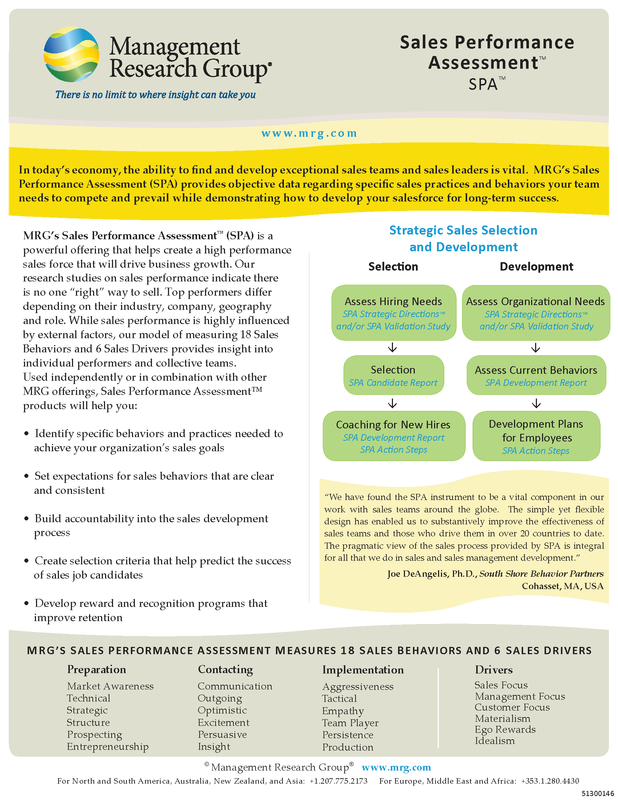 MRG’s Sales Performance Assessment™ (SPA) is a powerful offering that helps create a high performance sales force that will drive business growth. 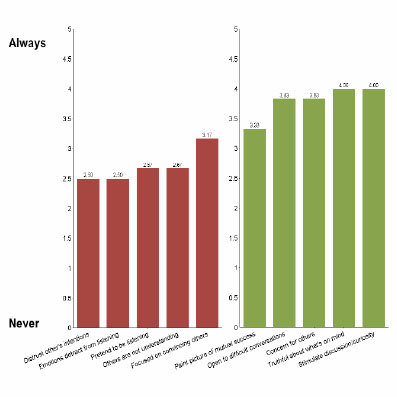 Our research studies on sales performance indicate there is no one “right” way to sell. Top performers differ depending on their industry, company, geography and role. 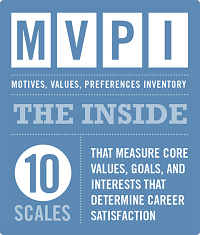 While sales performance is highly influenced by external factors, our model of measuring 18 Sales Behaviors and 6 Sales Drivers provides insight into individual performers and collective teams. 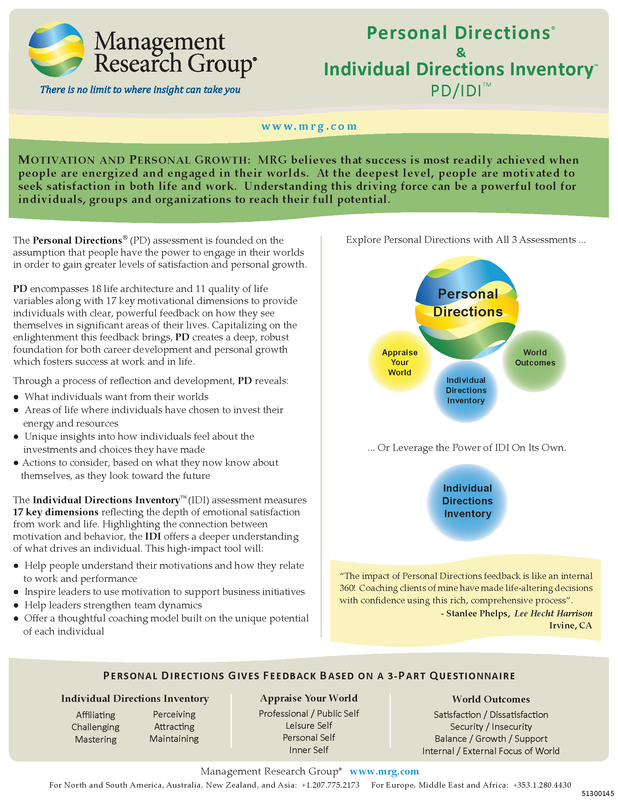 The Personal Directions® (PD) assessment is founded on the assumption that people have the power to engage in their worlds in order to gain greater levels of satisfaction and personal growth. PD encompasses 18 life architecture and 11 quality of life variables along with 17 key motivational dimensions to provide individuals with clear, powerful feedback on how they see themselves in significant areas of their lives. Capitalizing on the enlightenment this feedback brings, PD creates a deep, robust foundation for both career development and personal growth which fosters success at work and in life. The tool offers leaders and teams state of the art technology for clarifying and optimally shaping their unique culture and organizational dynamics for higher levels of Conversational Intelligence and for business success. 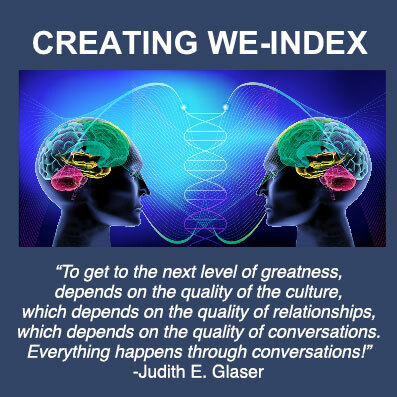 The assessment identifies what conversational patterns are opening the space for elevated engagement and what conversational patterns are blocking success. Most extraordinary is The Creating WE DNA Assessment’s ability to measure an organization’s levels of trust and alignment toward a shared vision for the future – across seven, vital success dimensions, and 49 behaviors – leading to breakthrough business results. Contact us to discuss how to use this innovative tool to create shared understanding and to clarify the action steps individuals, teams and the whole organization can take and see immediate results. We’ll work with you to create Executive Briefings, Team Workshops, Summits and enable you to create a Journey Map to catalyze change. The results will have permanent impact on your Organizational and Leadership DNA. Self-Catalyst Tool: Each person can use the tool to gauge the level of intelligent conversations they are having with others. 360 Catalyst Tool: An individual can use the C-IQ Catalyst Tool as a 360 Tool. This would mean selecting people such as boss, peers, direct reports and others to give feedback on their level of C-IQ. This will provide a clearer picture of how the person is impacting others at work. Team Catalyst Tool: The Team C-IQ Catalyst Tool provides a profile of a team’s level of C-IQ awareness. This Tool can be used to help a team develop higher levels of C-IQ at work. Self: Each person can take the assessment to gauge the level of trust building skills they are aware of using and identifying skills, which need to be used more often to ensure trust with others. 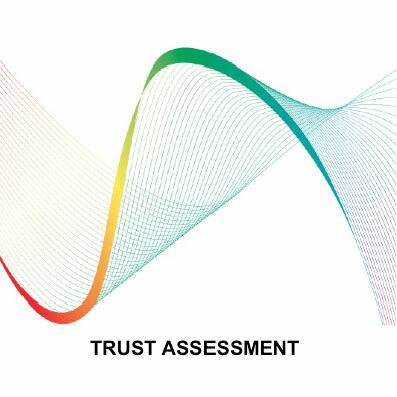 360: An individual can use the TRUST Assessment as a 360 by selecting people such as boss, peers, direct reports and others to assess that individual’s level of expressed trust. This will provide a clearer picture of how the person is impacting others across the trust continuum. 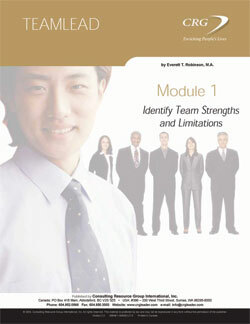 Team: The Team Trust Assessment provides a profile of a team’s level of perceived trust. This Assessment can be used to help a team develop higher levels of trust across the 5 dimensions.